"The End of a Long Voyage"
Every day as Ed White goes to work, he is reminded of all of the lives given in service to our country. As he passes by the Arizona Memorial in Pearl Harbor, Commander White imagines what happened there on December 7, 1941. He envisions the terror of the defenseless sailors aboard their ships as the Japanese zeros came diving toward them, streaking through the smoke filled skies, and igniting the world around them. His emotions are mixed. He grieves for the lives of the lost and their families, but at the same time remains proud knowing that in his own way, he and others have taken over where they left off in the honorable service of our country. Commander Ed White, his friends still call him "Ed," remembers first learning about Pearl Harbor in his textbooks at Moore Street School, a block or so down the street from his Mimosa Street home. His first true experience with the infamy of that fateful December Sunday morning sixty seven years ago came while he was standing on the bridge of the USS Holland as she passed by the various memorials. His desire to find out what really happened that notorious day drove White to study what happened, why it happened and the lessons he and others can learn from the attack. "Once into port, I toured just about every memorial, and each has their own story to tell. Although tragic, this event united Americans, as did the 9-11 attacks," said White as he complimented the American people for their ability to navigate through the bad times with the help of God to serve his purpose. Every morning as he drives down the Kamehameha Highway from his McGrew Point home, he observes bus loads of tourists, who come from all over the world and stand in line for hours, just to pay homage to the crew of the USS Arizona and the more than 3000 souls who lost their lives on the Hawaiian Island of Oahu. As a young boy in Dublin, Ed White loved to play basketball - being taller than most of the boys in his class helped a lot. 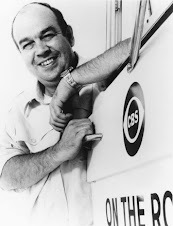 After he graduated from Dublin High School in 1977, Ed had planned a career in the grocery and dry goods business, much like his paternal grandfather of the same name. While working and going to college in Brunswick, Ed began to notice the big ships as they appeared and disappeared over the horizon near St. Simons and Jekyll Islands. He wondered to himself, "What is beyond the horizon?" He remembered visiting with his uncle Sibley White, an old navy man. "Uncle Sibley used to show me pictures of the exotic places he had visited while he was in the Navy. I can remember sitting with him on the white sandy beaches as a child and looking out over the water," White fondly remembered as he thought about those days and what the people aboard those ships were going to see after they disappeared below the sky. Suddenly the thought of selling groceries drifted out of his head and Ed found himself enlisting in the U.S. Navy. "I started out as a Seaman Recruit, at the bottom of the totem pole in 1977, " Ed commented. Over the next dozen years, White, the youngest son of Judge William H. White and his bride, the former Melrose Coleman of Dexter, climbed the ladder in rank up to Senior Chief Petty Officer. In 1990, he was commissioned an ensign. Over the last eighteen years, White has risen in the ranks up to the position of Commander. He credits his success as an officer to his time as an enlisted man and learning how they think and how they tick. "I feel it has made me a better leader as an officer," the Commander said. As an enlisted officer, Ed served aboard the USS Mount Whitney and the USS Edison. He lived around the country in such places as Norfolk, Austin, Nashville, Newport and Galveston. His first assignment as an officer came when he served aboard the USS Holland as the ship's Secretary, Personnel Officer and Administrative Officer. His next post was aboard the USS Theodore Roosevelt, which saw duty in the Mediterranean Sea. After a three-year stint as Operations Coordinator for the U.S. Defense Attache Office in Australia, White returned to the states as Personnel Officer at Pensacola, Florida. From July 2000 to June 2003, Ed served as the Executive Officer of the U.S. Navy Personnel Support activity for the Far East/Pacific. While serving as Administrative Department Head aboard the aircraft carrier USS John C. Stennis, White was awarded the Stennis Straight Furrow Leadership Award for 2004. 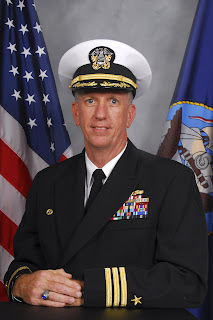 In March 2005, White was once again honored by being given the position of Executive Officer of the Naval base at San Diego, California, the largest of its kind in the Pacific and the Navy's second largest around the world. Today, White serves as Staff Enlisted Personnel and Fleet Personnel Distribution Officer for the Commander, U.S. Pacific Fleet under the command of Admiral Bob Willard. Among the numerous medals ribbons which enhance his uniform are the Defense Meritorious Service Medal, two Navy Meritorious Service Medals, six Navy Commendation Medals, three Navy Achievement Awards, along with campaign medals from Southwest Asia (bronze star,) Armed Forces Medal, Humanitarian Service Medal, three Sea Service Deployment Ribbons, six Overseas Service Awards, and the Kuwait Liberation Medal. Now, just three months shy of his scheduled retirement after thirty-one years of service, Commander White is preparing to pull into port for the last time in his naval career, giving up a sure promotion to Captain and even a possible one to Admiral. He is retiring, not because he is tired of being in the Navy. "The Navy has meant everything to me. It has helped me to mature and given me opportunities that would I have never received, especially my education," White, the holder of a Master's Degree in Human Relations from the University of Oklahoma, remarked. He will miss talking with the President, congressmen, and ambassadors. He will miss conversing with celebrities and sports stars before they perform. And he will miss visiting the exotic places he saw in his uncle's photo album. He will always remember the thrill of piloting several of the Navy's largest ships as some kid stares as them with his mouth wide open. No, the real reason Ed White will never go to work again in his blue uniform is some things he doesn't want to miss. For thirty years, Ed's wife Kim has supported him. "I feel it's time to settle down. I am away from home for up to a year and I have constantly moved from place to place," White lamented. "Now it is time for me to support and be there for her now that the kids are out on their own." His eldest child, William Douglas White, has just graduated from Wake Forest University. His youngest, Meredith Lynn White, is a freshman at the state university in San Diego, California, the place where White hopes he can retire, perhaps as a civilian worker while maintaining his ties with the Navy. He wants to be there when his daughter graduates. He wants to be there for the birth of his grandchildren. He simply wants to be home when he wants to be home. When he came into the Navy, Ed White never thought he would have the honor of serving at a place like Pearl Harbor with its roots deep in Naval history. Ed, like many others, joined the Navy for the travel around the world, the free education and a new life. It didn't take but a few moments after he first stepped into Boot Camp and later aboard his first ship, for Ed to realize that it was his purpose in life to serve his country. "I have many people to thank, starting with God above, for what He has provided. I 've been truly blessed, and I couldn't think of a better place to close my Naval career than here in Pearl Harbor." Commander White's retirement ceremony, scheduled for next February, will be aboard the Battleship USS Missouri, the same ship on which the Japanese surrender was signed. "Pearl Harbor will always have a special place in my heart," Commander White concluded. Commander White sees the Navy's role as a peace keeper through a strong presence around the world. He adds that the Navy is always training to fight when called upon, not only on the seas, but in the air and on the ground in support of the Global War Against Terrorism. As a military man and an American, White believes that it is important to support our new leaders, despite what differences you may have with them. White asks everyone to "Pray that God will guide them while they hold the most important positions in the world." He adds, "I encourage all the people of Dublin and Laurens County to take the time to pray for our soldiers, sailors, airmen and Marines and their families." Lastly, to all his friends and family,his mother Melrose, his brothers Herschel White and Bill Fennell back home in Dublin and his sister Lavonne Ennis in Talbotton, Ed wishes "a Merry Christmas, and a Happy New Year." The new year will bring a new life and new opportunities for Ed, Kim and their family. Just for a change, Ed and Kim can then take a stroll through the neighborhood or a long drive through the country and see the wonders of this side of the horizon. As you cast your anchors aweigh and sail at the break of day, and until you reach the shore, may we all wish you a happy voyage home. On February 12, 2009, Commander Ed White officially retired from the United States Navy. The ceremony held aboard the Battleship Missouri, upon which the Japanese government signed the official surrender documents on September 2, 1945. The guest speaker for the event was Admiral Robert F. Willard, commander of the U.S. Pacific Fleet. After brief remarks by Commander White, a shadow box was presented to the retiring officer. Among the many items of his naval memorabilia was an American flag, which had been flown over the Laurens County Courthouse, where his late father Judge W.H. White, had been Superior Court for many years. The flag had also been flown at Moore Street School, where Commander White had attended as a young boy. Before the ceremony, the flag was also flown aboard the historic battleship. Admiral Willard, acting on behalf of the President of the United States, awarded Commander White the Legion of Merit for exceptionally meritorious conduct in the performance of outstanding services to the United States of America. All photos courtesy of Jordan Hampton. Look out New York, Jordan is coming! With her portfolio in one hand and her bag in the other, Jordan Hampton of Dublin is headed for the Big Apple. This seventeen-year-old model, with a classic model figure, is determined to be a successful model through hard work, determination, and the support of her family and a vast network of hometown friends, whom she graciously acknowledges and appreciates. For all of her walking years, Jordan has loved to dance. She still dances four to six times a week as a way of staying in shape for her modeling career. Her diet usually includes chicken, fish, fruits and vegetables in moderate amounts. Though she will occasionally eat some junk food, Jordan typically prefers fruits to fries and chips. Jordan’s dancing career began at the age of two at the Fancy Dancer School in Dublin. Her dancing skills have led to her being more graceful as a model and having a more athletic body, which helped her to recover faster than normal after a recent surgery on her knee. “She is a ham, like her Daddy,” her mother says. “When she is on stage, she lights up!” Both of her parents are singers. Jordan actually has a good voice, but she never took up signing. She also inherited her father’s ability to pick out a tune on a piano. As a young girl, Hampton never aspired to be a model. At the age of thirteen, Jordan was attending a beauty pageant in Atlanta when a representative of the Elite Modeling Agency approached Jordan and her mother and asked her if she was interested in a career in modeling. The Hamptons were skeptical at first, but when they learned that the Elite Agency was one of the top three agencies in the world, the offer seemed not only interesting, but extremely exciting. It was then that Jordan and the Hamptons were introduced to Victoria Duruh, of Elite, whoever since then has been very helpful to Jordan, almost as if she were her big sister. Just before her fourteenth birthday, Jordan signed a contract with the New York Elite Agency. During her four-year career, she has worked with the agency in Atlanta, New York, Miami, Chicago, and Barcelona, Spain. During the last four years, Jordan has traveled around the world. She spent ten weeks in Singapore, Malaysia and five more weeks in Paris, France. Her brief stay in the French capital, one of the world capitals of modeling, was as a major stepping stone in her young career. Another highlight was working on eleven shoots in a single year as one of the “New Faces” of models around the world. “I travel with Jordan everywhere she goes,” her mother said. As her “traveling buddy,” Roxanne Hampton helped her daughter meet the not only rigorous work schedule, but kept her on track in her high school studies. Through the aid of online courses and home schooling, Jordan could have easily taken the bare minimum courses required for graduation. But instead, she chose to take as many honor courses as she could, including extensive foreign language courses. Despite her demanding course and work schedule, Jordan finished high school in three years and with a 4.0 grade point average - an accomplishment to be applauded for any high school student. As she prepares to move her home to New York, Jordan is financially set to work as a model without the need of a second job to pay the bills. Thanks to careful financial planning by her father, Dr. Derrick Hampton, Jordan was encouraged to put aside a large portion of her earnings early on, so that her savings would support her in a career once she got out on her own. Modeling is hard work, more than just posing and smiling. Jordan often works from eight to nine o’clock in the morning to seven o’clock in the evening. All day long, Monday through Friday, Jordan, when she is not on a shoot, goes through castings with interviews, sometimes with six models and sometimes with two hundred all competing against each other. Sometimes when the photographer needs a background in busy metropolitan areas, Jordan has been called upon to pose for pictures in the middle of the night, from the rooftops of skyscrapers to the deserted predawn streets of Times Square in New York. Feeling bad or being sick is rarely an excuse to miss work. She once had to be a work with a temperature of 102 degrees. The agency has high expectations for Jordan. Many who see her photographs think that she looks exotic and that she couldn’t be a good ole’ country girl from Georgia. Her grandmother sometimes doesn’t recognize and refuses to believe that the girl in the pictures is Jordan, but Roxanne affirms that it is, because she was there with her daughter on every shoot. Jordan possesses a natural ability as a model, she is comfortable in front of the camera, and photogenic. She sees modeling as her calling. With all of the confidence in the world, confidence that she will need to succeed in the highly competitive world of modeling, Jordan said, “I intend to take New York by storm and I want to be the next super model.” Another requirement to become successful in the business is a strong work ethic, and Jordan possesses just that. Each night, she plans and schedules all of her activities for the next day, and then thoroughly exhausted, she goes to bed. Realizing that the average career of a model is a mere ten years, Jordan is already busy planning her career after her modeling days are over. After the day long shoots are over,she wants to go into the modeling business, perhaps in design or in management, or maybe, just maybe, she might try her hand as a gourmet pastry chef. She also wants to go to college and take a few dance classes, but not as long as it interferes with her modeling career. On this 4th of July, we once again celebrate our independence, ur patriotism and the overabundance of blessings which have been bestowed upon us by hose who have gone before us. Belinda "Brenda" Higdon Pinckney is not your typical general. Missing is the gruff exterior we see on television and the movies. She is not a fifty- plus- year- old white male soldier. There is no "gung ho" in her heart, except for the causes she believes so strongly in. When she dons her dress blue uniform, there is a heart of gold behind the mass of commendations, ribbons and stars. 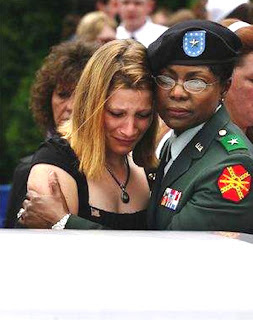 Though her shoulders are not broad, thousands and thousands of the family members of the soldiers of the Army know that when they need to lay their head on them, General Pinckney will be there to comfort them. 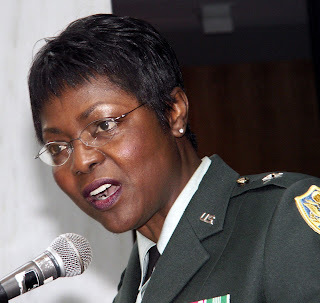 Belinda Higdon Pinckney, one of only a few African-American female general officers in the United States Army, acknowledges the blessings she has. Her mission is to share those blessings and to make life better for those coming behind. Belinda "Brenda" Higdon Pinckney was born in Dublin, Georgia in 1954. Her parents, Homer and Lucy Higdon, cared about their children and did their best to provide all they could for their six children, even if it meant working two jobs. Though they had little education themselves, the Higdons were determined that their children would receive the best education they could. Belinda attended kindergarten at Howard Chapel Methodist Church not too far from her home in Katie Dudley Village neighborhood of the Dublin Housing Authority. As she looks back to the days she spent in Katie Dudley, she fondly remembered that if she or any other of her siblings and playmates did something they weren't supposed to be doing, they would first get a whipping by a concerned neighbor and then return home for a second stern, but loving, whipping. She applauds those in her community who helped keep the kids "on the straight and narrow." School. "We were challenged to do our best," Pinckney said. "Mrs. Brinson was one of my favorite teachers. She was like a mother to many of us. We were put into groups, A,B,C and D. You didn't want to be in the D group," she continued. She was in the A group and remained in the same classes with a core group of classmates for nearly ten years. Among the teachers General Pinckney remembered the most were Mrs. Jackson, Mrs. Crews, Bonnese Brower, Ernest Wade, Martha Myers and her principal, Charles W. Manning, Sr.
A member of the Finance Corps, the General credits Mrs. Myers for giving her the basic foundations of understanding, and actually loving math. It was that love of math that led her into the Finance Corps. Today, she is the only minority Finance Corps Officer in the history of the United States Army to be commissioned as a general officer. Brenda's life changed dramatically in the summer of 1970. In an effort to promote harmony between the races, Federal courts ordered that Dublin High School and Oconee High School be merged. Brenda and hundreds of her classmates and friends were ripped away from their beloved Oconee High School. It was the only school they had ever known. Bused or transported all the way across town, Brenda and the other students at Oconee had a difficult time in the transition. There were scared and naturally, just angry. As I look back on those days from the other side of the tracks, these students were the trailblazers of their day. It was these students who entered a new world and made it easier for those who came from behind. It was one of the darkest days in the history of Dublin High School. An early morning pep rally was going on in the front of the school. Suddenly a rock, reported a chunk of concrete left lying by a forgetful contractor, appeared to come from where the black students were standing. It struck a white cheerleader and then as they say, "all Hell broke loose." All students in the school were sent home. The football game went on that night, but without the band. Many of the black students were put on buses and sent back home. As Belinda boarded the bus, a bee crawled under her bright yellow clothes and stung her, prompting her to say "even the insects are against us." When I talked to the General for the first time, I told her that I was there that dark day and that we have overcome most of those differences which so bitterly divided us thirty seven years ago. She smiled. Brenda transferred to East Laurens High School where she graduated with honors in 1972. Belinda attended Clark College in Atlanta and studied medicaltechnology. She failed to realize that in her senior year she would have to transfer to Emory University to complete her degree. Her tuition costs were going to double. She did transfer to the Medical College of Georgia, but when she was only twelve credit hours shy of a degree, circumstances led to her quitting college. "It was probably the best thing that ever happened to me," reasoned General Pinckney.Frustrated and disappointed at how she was forced out of school, Belinda promised herself that she would never quit anything ever again. A career in the military was an early apparent option. Her oldest brother was an Army paratrooper and Vietnam veteran and her next brother, a Marine and also a Vietnam veteran. Her older sister joined the Navy. So Brenda, looking for something more out of life, enlisted as a private first class in the Army in 1976. Older than most other members of her rank, Private Higdon was quickly put into leadership positions. "The Army exposed me to reality early in my life and made me feel good," said Pinckney who believed she could make the army a career. It wasn't long before Private Higdon looked around at the non-commissioned officers and how they handled soldiers. She said to herself, " I can do that." So she enlisted in Officer Candidate School in 1978 and graduated the following year. It was then, more than two decades ago, that she began her goal to look after soldiers, the regular men and women of the Army. The transition from an enlisted soldier to an officer was a daunting task. Pinckney relied on the lessons she learned in school to guide her through the difficult tasks ahead. She sought out role models to learn from, much like she had at Washington Street and Oconee High schools. The army placed her in a position to advance, but like her parents, the young officer wasn't looking for any handouts. Determined and highly independent, Pinckney took advantage of every opportunity to advance up the chain of command. "Initially, it was hard for me to transition from being an enlisted soldier to an officer because, first of all, I only had two-plus years in the military as a PFC and specialist. Secondly, other than my training in OCS, no one had really sat me down and talked to me about 'officer ship.' The expectations are much greater. I was no longer only responsible for my actions, but for the welfare of my subordinates, too," Pinckney said. General Pinckney has demonstrated her ability to succeed at all levels. Early in her life, Bonnese Thomas McLain, one of her favorite teachers, noticed something special in Brenda. "Brenda and a small group of kids would meet me around 7:00 a.m. nearly every morning wanting to make the extra effort to learn more math," Mrs. McLain said. After she entered the army, Belinda Pinckney continued to strive toward educational excellence. She earned a Bachelor of Science degree in Business Administration at the University of Maryland, a Master of Public Administration degree in Financial Management at Golden State University, and a Master of Science degree in National Resource Strategy from the Industrial College of the Armed Forces. 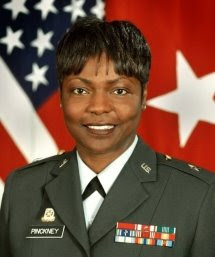 During her long and successful military career, General Pinckney has served as a Congressional Appropriations Officer, Office of the Under Secretary of Defense Comptroller); Principal Deputy Director/Army Element Commander, Defense Finance and ccounting Service; Brigade Commander, 266th Finance Command and US Army Europe Staff Finance and Accounting Officer, Heidelberg, Germany; Battalion Commander, Training Support Battalion; Soldier Support Institute, Fort Jackson, South Carolina; Military Assistant to the Assistant Secretary of the Army(Financial Management and Comptroller); Budget Analyst, Technology Management Office, Office of the Chief of Staff; and Company Commander, Headquarters and Headquarters Company, 266th Finance Command. General Pinckney's military awards include the Defense Superior Service Medal, two Legion of Merit medals, six Meritorious Service Medals, four Army Commendation Medals, two Army Achievement Medals, the Office of the Secretary of Defense Staff Badge and the General Staff Identification Badge. As the general begins her thirty second year in the military, she is as committed as ever to set the bar for all military women to come. In 2001, Pinckney was the first African-American woman to be inducted in the Officer Candidate School's Hall of Fame. She is one of only two African American generals and one of only a dozen or so female generals in the United States Army. "We need to continue to tell the stories, so that every generation will know and learn from these stories because we as a country are not particularly proud of some of this history,"she noted; "We do not want to repeat the bad history, and we want to tell the stories of the good history." An advocate of women's rights, General Pinckney acknowledges the outstanding accomplishments of women in the military saying "Many contributions of women have gone unrecognized, the stories of their struggles and triumphs remain untold" General Pinckney recognizes the importance of their accomplishments but also realizes the tendency to take them for granted. She believes it is important to pass along the stories so that succeeding generations will know and grow from them. General Pickney comforts the daughter of a fallen soldier. Just thirty-six hours after she addressed a reunion of her fellow alumni of Oconee High School, General Pinckney boarded a plane bound for Houston, Texas and another funeral, another day of comforting the anguished with dignity and honor, all the time knowing that she is serving her nation proudly and setting an example for women and minority officers in the future. With a legacy of education, leadership and old-fashioned values she learned in the schools, churches and homes of Dublin and Laurens County, General Belinda "Brenda" Higdon Pinckney is bound for greater things to come in her Army career. It is with great honor that I, on behalf of all of the people of Laurens County and the United States of America, salute our very own hometown hero for a job well done as she seeks to better the lives of her soldiers and their families. reunion of Oconee High School 2007. Karl Slover, Dublin St. Patrick's Festival Parade, 2006 @ Scott B. Thompson, Sr.
Have you ever met someone that you liked to be around the first time you ever met them? If you are lucky, sit down beside him and just listen. Listen to his stories. Listen to his contagious laugh as the tales flow. He tells and retells the same stories verbatim, but everyonce in a while, he’ll add a new twist or accent his point with an obscure phrase and his infectious giggle. And, once you get up to leave, you’ll find that you have just met one of the warmest, funniest and kindest people you’ve ever met. I felt that way the first time I met Karl Slover and every time I sit down with this little man with a big heart, big ears and an even bigger grin. Karl was born Karl Kosiczky on September 21, 1918 in Prakendorf in that portion of Hungary which later became a part of the Czech Republic and later Germany. Karl’s six-foot six-inch tall father expected that his only son out of his five children would follow in his footsteps as a local gendarme. No one knows exactly how large Karl was when he was born, but for the first few years of his life, Karl appeared to be a normal child. But then, Karl stopped growing. Desperate to make his two-foot tall eight-year- old son grow, Karl’s father came with all sorts of "bright ideas and brainstorms" as Karl calls them. "He got a big wooden barrel and filled it with coconut leaves and boiled them, and then put me in it. I was as red as a lobster when they took me out," Karl recalled. His mother had to coat him all over with an ointment to keep his skin from blistering. Eight doctors were called in to help. "They put me on stretchers," Karl said, "but one of the doctors thought they were doing it all wrong," he said when his bones began to pop. "They would put me in a sand pile. I would wear a pair of long underwear. We had a maid. My mother would tell the maid, who came in around 2:00 p.m. one day, to get me out around 4:00 while she went to the grocery store. The maid went inside and it began to rain. I cried out for the maid, but she didn’t hear me. I called to our dog, a Doberman Pinscher. She came over and picked me up and drug me over to the dog’s house. Our dog loved us. My mother got home and asked where I was. The maid shrieked, ‘I forgot about Karl. He’s still out in the yard.’ My mother looked at the sand pile, and I wasn’t there where I was supposed to be. My mother called to me. I told her, ‘I’m here in the dog’s house.’ My mother and my father bawled out the maid." One day Karl and his sister were returning from a walk when they stopped by the mailbox. They handed a letter to their mother who read it to Karl. The letter said that an agent was going to be sent over to the Slover house to see if Karl would be interested in joining Singer’s Midget Show, the largest midget show in the world. Karl remembers leaving the railroad station with his father as if it was yesterday. "Dad and I went to the train station. He told Mr. Singer that he was glad to get rid of me and that I would do him no good in following in his footsteps," Karl recalled. Though his mother reluctantly relented, Karl kept thinking to himself "maybe it is for the best." Karl missed his family, but being around people of his own size made up for it. "I was with little people more my size. It was like a new family," said Karl. The midget show owners tried to find clothes for Karl. They looked all over for underwear. Finally they found a man in a department store who gave me some underwear to try on. "They went back and told me that the underwear had been given to the world’s smallest midget. The man was so excited that he gave me and some of the other midgets all the underwear we could wear for free," Karl chuckled. John Ringling, one of the world’s most famous circus owners, sought out Karl for his circus. After all, Karl was billed as the "World’s Smallest Midget," and Ringling had to have him in his big top shows. Karl remained with Mr. Singer and played in Billy Rose’s "Jumbo Show" in the Hippodrome Theater in New York. He appeared in "They Gave Him a Gun" with Spencer Tracy, his favorite co-star. His first speaking role came as "Sammy the barber" with an all midget cast in "Terror of Tiny Town." In another single line movie appearance, Karl uttered the classic line "Out, please!" in Blockheads, one of Laurel and Hardy’s most popular films. Karl as a singing bass player in barroom scene in Terror Of Tiny Town. Karl’s most famous role came as one of Munchkins in the Wizard of Oz. 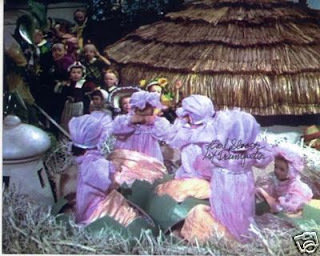 Karl played five roles; the first trumpeter, a sleepy head, a soldier, one of those who escorted Dorothy down the Yellow Brick Road, and even a female villager to balance out the mostly male midget cast. Karl is most often asked why he thinks the Wizard of Oz remains so popular nearly seventy years after its original airing. His standard answer goes something like this, "Children love it. It’s a family movie. There’s no filthy language in it." Ironically, Karl’s parents never saw the movie, nor did any of his sisters. Karl as the First Trumpeter (far left) in the Wizard of Oz. 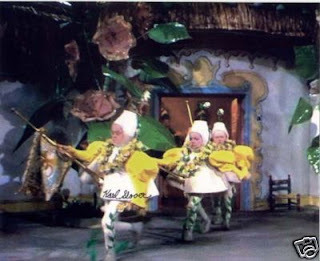 Karl as a Sleepy Head (far right) in the Wizard of Oz. Singer’s Midget Show continued to stage performances until the early days of World War II. Many of the Munchkins left Singer because he had robbed them of most of their pay. They made less than the dog Toto. The troup disbanded, and Karl was left to face the world alone. He went to work for B.A. Slover and Ada Slover in Tampa, Florida in their amusement show. Karl finally received his American citizenship and elected to adopt the new surname of Slover for the family who tried to adopt him but couldn’t under the prevailing state law. During the war, Karl received a letter from his sister, who was confined to a concentration camp in Germany. He told her to try and contact their father to get her out and then go to the American Zone where she would be safe. Ironically, the abandonment of Karl by his father may have not only saved his sister’s life, but may have saved Karl himself from the maniacal and diabolical Nazis who wanted to experiment on non pure Arians. It would be thirty seven years before Karl would return to his native home. He found his mother living in the American sector of Berlin. He expected to find that his mother would be gray, but he was surprised to find that she still had blonde hair. Karl discovered that she had little memories of him and his childhood, a result of the horrors she endured during the war. After the war, Karl continued to work with the Slovers as a barker, ride operator, and ticket taker. He also kept the books. When his days in the carnival were over, Karl’s main occupation was a poodle trainer. "I first started training Daschunds and all small breeds of dogs and even some police dogs as guard dogs. Then, I mostly trained poodles. I didn’t believe in hitting dogs. Once you hit them they won’t obey you. I tried to give them a snack when they did what I told them. I also trained horses for a time. I used to train dogs and perform them at nursing homes, schools, birthday parties and even churches. But you can’t get any more jobs like that, so I gave it up," Karl recalled. Karl never learned how to drive though he did try driving a go-cart. It scared "the heck" of out him and he gave up driving forever. For ten years, Karl would pack up his memorabilia once a month and go an antique mall near his home in Hyde Park and set up a table covered with an emerald green cloth. For a small fee of ten to fifteen dollars, he sold autographed pictures of himself from the Wizard of Oz and other films. Slover made his last appearance in July 2004. For nearly twenty years now, Karl has traveled all over the country for Oz festivals and autograph signing sessions. Donna Stewart Hardway, a regular sized child who portrayed one of the Munchkins, described Karl as "a baby doll." "When people find out that he was in the movie they go nuts. Children especially warm up to him," she continued Karl’s closest friend among the surviving Munchkins is Clarence Swensen, who played a soldier in the movie. "He’s a good and nice guy," Karl quipped. After his movie career ended, Karl began to grow. He always wanted to grow to a normal height, but after being dependent on others to do the most mundane of daily tasks, his extra height allowed him to do things on his own. He never regrets being a midget. "I got to be in the Wizard of Oz and got to meet some movie stars and a lot of nice people," Karl said. These days Karl likes to watch television, especially game shows. When the weather is warm, Karl loves to work in his garden. He loves sweets, especially chocolate, and more especially chocolate ice cream. I recently watched Karl eat the "largest hamburger he ever saw" before topping off his meal at an LA eatery with a big bowl of chocolate ice cream. Karl Slover is more than just a Munchkin. He is one of the kindest, sweetest, gentlest and funniest people you will ever meet. After nearly ninety years of traveling all over the country, Karl firmly believes "there is no place like home," and he is right here, living in the Emerald City to prove it. "The lines on his face are bunched together like rings on a dwarf maple. The tiny, squeaky voice in unmistakable. He was delightful, polite and witty, with a face forever locked in a smile." "I’ve got a good life. A wonderful life. I have no complaints." Advice to people in their eighties. "Just try to get along the best you can. Enjoy what you have. Enjoy where you live. Most of all remember what Judy Garland said, ‘There’s no place like home.’"
For nearly seventy years, Karl Slover has been following the Yellow Brick Road to the land of Oz. Though he and his fellow midget actors were on screen for less than ten minutes in the epic film "The Wizard of Oz," the Munchkins have become icons of American cinematic history. Finally, and most fittingly, seven of the nine surviving members of the Munchkin cast returned to Hollywood, California, where their legend began in 1939. During the week of Thanksgiving, on a boulevard lined with golden stars, Karl Slover, Mickey Carroll, Ruth Duccini, Margaret Pelligrini, Meinhardt Raabe, Clarence Swensen and Jerry Maren accepted a well deserved and long overdue star on the Hollywood Walk of Fame on behalf of the 124 actors, who welcomed Dorothy Gale over the rainbow. Many people thought that the Munchkins were already honored with their own stars. Chicago restauranteur Ted Bulthaup led the effort to have the Munchkins awarded their own star. His dream was aided by such Hollywood icons as Steven Speilberg, George Lucas, Ted Turner and dozens more. Actually they are the only group of characters to be so honored for their memorable, albeit brief, appearance on the big screen. Karl Slover, a resident of the Sheridan Place in Dublin, received the news this past summer. 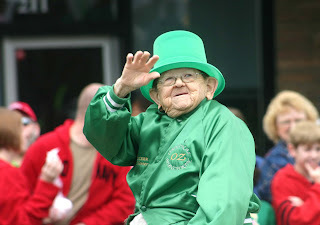 The 89-year- old Slover frequently travels throughout the country to Oz festivals and autograph sessions. Upon the receipt of the news, Sheridan director Gina Ensley Drown and her staff began the preparations for the trip to Hollywood during the week of Thanksgiving. A dozen Dubliners traveled to Hollywood to accompany Karl. Ten travelers stayed up all night following a Dublin football game to catch an early morning flight. The celebration began on Sunday night with a delicious meal hosted by Mayor Phil Best and his wife Cile at the L.A. Prime, some three hundred feet above downtown Los Angeles. Mayor Best presented an honorary award to Karl, who was accompanied by his niece Gay Griffit. Dublin Mayor Phil Best toasts Karl. Laura Ensley, Karl Slover and Ashley Ensley. align="justify">The festivities began in earnest on November 19 at Graumann’s Chinese Theater. The Hollywood Preservation Society sponsored a showing of "The Wizard of Oz." It would be the last time that this legendary film, specially enhanced just for this showing, would ever be shown in its technicolor format on the big screen. The entrance to the theater, one of the country’s most historic movie houses, was lined with yellow brick road carpet, a battalion of cameramen, and a few hundred adoring fans and passers by. My son Scotty and I, along with Pam Green of WDIG-TV got our crowded guard rail spots two hours early. The official media stood in relative comfort across the aisle in their reserved places. While the rented spotlights beamed into the unusually foggy L.A. sky, the honored guests began to arrive. photographers in front of Graumann's Theater. As the Munchkins began to walk down the yellow carpet, a hoard of media, more voracious than the wicked witch’s monkeys, swarmed over Karl and the other midget actors. They don’t mind being called midgets, because that’s what they are. After the honorees had their pictures taken with the sponsors and in clips for the national networks, the ceremony opened with a humorous introduction by Gary Owens, of "Laugh In" and "The Gong Show" fame. Stan Taffel, a comedian and Hollywood historian interviewed the Munchkins. When it came Karl’s turn, he began to sing "We’re off to see the Wizard," a charming tune which drew a loud round of applause and quite a few tears. Karl relaxes prior to screening of Wizard of Oz. The feature of the night was the showing of the Wizard of Oz in the same theater it premiered in August 1939. The picture was so clear you really could see the freckles on Dorothy’s face. If you have never seen the movie on a big screen, you missed a wonderful treat. And though most of the audience had seen the movie before - some dozens of times - there was reciting of the lines, applause, laughter, and cheers throughout the showing. Some in the Dublin delegation drew the attention of several photographers and a documentary cinematographer as we were all dressed in emerald city green attire, each of us wearing specially designed "Karl Slover Fan Club" buttons. Also present that night were actresses Tippi Hedren, of Alfred Hitchcock’s "The Birds," Margaret O’Brien of "Meet Me in St. Louis" and a childhood friend of Judy Garland, and Anne Rutherford, who played a sister of Scarlett O’Hara in "Gone With the Wind." The granddaughter of Frank Morgan, who portrayed the Wizard and several other Emerald City residents, was in attendance along with the great grandson of L. Frank Baum, the writer and creator of the story. There were also several actors who portrayed Munchkins present, but because they were children and not midgets, they were inexplicably - to me anyway - not included in the festivities. Mrs. Jerry Maren, Jerry Maren and Karl Slover. Back row: Stan Taffel and Gary Owens. The highlight of the week came on Tuesday morning with the star presentation ceremony. Hosted by Johnny Grant, the "Mayor of Hollywood," and Joe Luft, son of Judy Garland, and a squad of politicos, the ceremony began right on time. Covering the entrance to the theater was a tall arch of balloons simulating a rainbow. The Munchkins arrived from their hotel rooms in a carriage, pulled by a horse of a different color. This particular steed was a pale purple one. The crowd swelled. The Hollywood High School band played. Karl walks toward the unveiling ceremony. Cameras went high into the air to catch a glimpse of the little people as they approached the podium. We had been at our station near the star site for two hours, long before any of the crowd arrived. The Munchkins walked down a wider and much longer yellow carpet strip to the site of their star, located at the far eastern end of the theater. In front of a battery of television and still photographers and barely within our view, the star was finally unveiled. After thousands of photographs and hours of film were taken, Karl and his comrades were given another carriage ride back to the Roosevelt Hotel. Following the presentation ceremony, a luncheon was held in honor of the Munchkins in the Blossom Room of the hotel. In the very room where the first Academy Awards were held in 1929, the tables were decorated with green table cloths and illuminated underneath to give the room a virescent glow, reminiscent of the chamber of the Wizard of Oz. Behind the dais was a striking rendition of the Emerald City. The tables were decorated with baskets filled with red poppies and a stuffed toy version of Toto. The luncheon passed all too quickly before the actors were once again whisked off to face the media for one final time and much to the chagrin of autograph seekers who had politely waited until they finished eating. Karl’s final night in Hollywood was spent with his niece and the folks from Dublin in a quiet restaurant on Sunset Boulevard. Following a long day and puny luncheon food, Karl enjoyed the largest hamburger he ever saw. Still hungry, Karl downed a big bowl of chocolate ice cream. Karl enjoying a big bowl of chocolate ice cream. Karl enjoyed the visit and appreciated the honor that he and his fellow Munchkins had finally received. Though he was honored to be there, he found nothing very exciting in Hollywood like he did seventy years ago. Feeling smothered by the media sticking microphones in his face and blinding his eyes with spot lights, the little man with the big smile was glad to be back in the "Emerald City" of Dublin. "Heck yeah, I am glad to be home," Karl said, "after all, there’s no place like home." Karl with Emma, Vicki, Kathy, and Mandi Hutto. All other photos @ Scott B. Thompson, Sr.